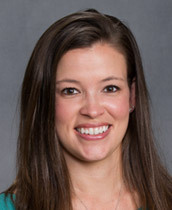 Dr. Humston is the newest addition to the Pinnacle Family Medicine team as of September 2011. She completed her undergraduate studies at Virginia Tech before attending medical school at the Edward Via College of Osteopathic Medicine (VCOM) in Blacksburg, Virginia. Having grown up in North Carolina, she chose to come back to the area in which she was born, Johnson City, to complete her residency training through ETSU. During that time, she was selected Chief Resident. Dr. Humston is a board certified physician who is a member of the American Academy of Family Physicians and the AOA. Dr. Humston is happily married. She enjoys playing golf, tennis and cooking when not providing healthcare. In addition to spending time with family, her absolute favorite activity is watching/attending Hokie sporting events – especially football.